"The Nick Munro mould has more possibilities than 31 X 10!" 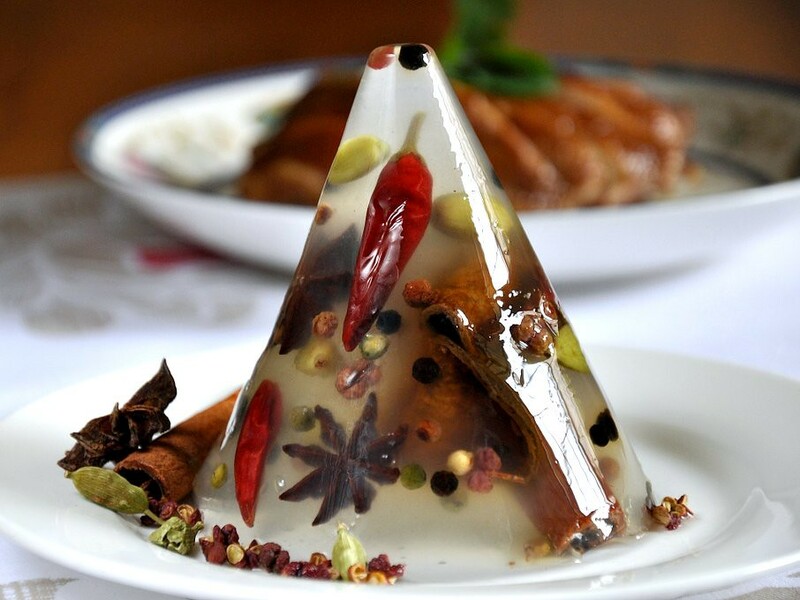 Konnyaku spice pyramid of cardamons, star anise, tangerine peel, several kinds of peppercorns, cinnamon bark and dried red chili. If using water or chicken stock without a gelling agent, the spice pyramid can go into the curry pot. I think all the other 9 bloggers in the Royal Selangor Pewter Jellyriffic Challenge are just as caught up in squeezing their cerebrum for creativity and imagination as I am. While cooking soy sauce chicken a few days ago, I thought it would be fun to use the Nick Munro mould to freeze all the spices for one of my best recipes, soy sauce chicken. The liquid would be chicken stock and the whole frozen spice pyramid can be kept in the freezer and thrown into the pot when needed. But is HOT here so ice would just melt before I can take enough photos for my post. But I liked the idea of a spice pyramid and if I can't cook with it, I thought, I can use it as a centre piece for a special dinner. I have problems using gelatine powder because gelatine jellies go soft quickly in hot weather and are delicate and tricky to turn out from the mould. Agar is a much better choice for hot weather (now I know why agar is the preferred gelling agent in tropical South East Asia besides the fact that it is made from seaweed and not the bones and skins of animals, making it halal and kosher) because it gels at room temperature and doesn't melt even in very warm conditions. Agar, however, is slightly cloudy compared to gelatine. Konnyaku, a gelling agent made from a Japanese potato, like agar, doesn't melt in hot weather and is clear when set. Perfect for my pyramid. I'm telling you, I'm enjoying all these jelly experiments. It reminds me of chemistry and the best part is I don't have to write any chemical equations. The bad part for me is the photography--too stressful. The other drawback is I think my family (and our fridge) is reeling from jelly overload--they have to eat all the jellies, good or bad. The mould perks (that's right, perks) up my kitchen window. 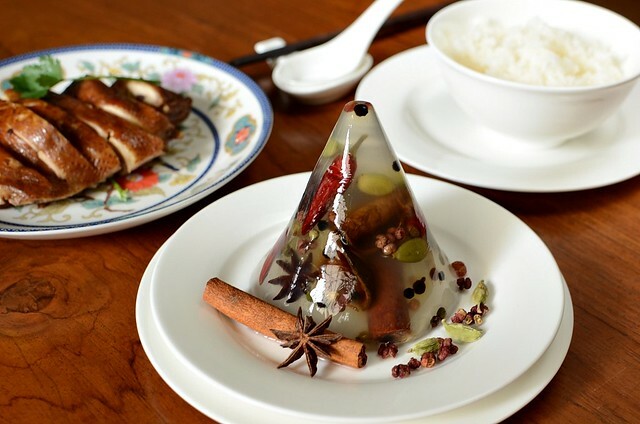 Don't you think the spice pyramid looks pretty and fun as a center piece, perhaps for a curry party or in my case, a soy sauce chicken dinner? 1. Put the water into a small, thin-based metal pot. Scatter (as wide and thinly as possible to prevent clumping) the konnyaku powder over the water and wait 2 minutes for it to soften. Heat gently, stirring all the time until agar is melted. You can use it straightaway as it will solidify quickly. 2. Rinse and place a Munro mould into a mug. Ladle 1/2 tablespoon of the molten jelly into the mould and leave in fridge to set. 3. Take mould out, place a mixture of spices and a bit of molten jelly just to cover. If you put too much, the spices'll float. 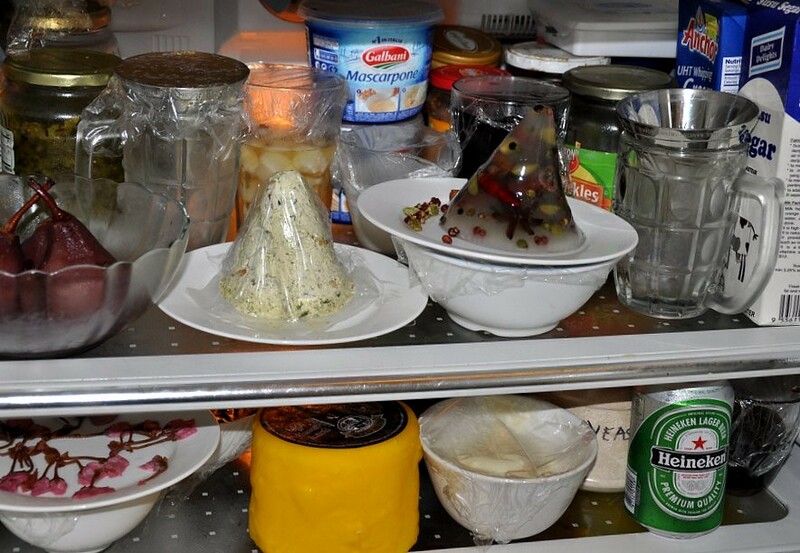 Leave in fridge again to set. Repeat until mould is topped up. Note: Make sure that the mould when full is level or jelly will lean when turned out. You may have to re-heat the jelly as it solidifies at room temperature. If you plan to freeze the pyramid for cooking later, I think using chicken stock is a good idea. Oh my goodness! That is so pretty and creative! Oh, yes! This is indeed a beautiful centrepiece, so creative! Youre going to win this hands down! That is beautiful and unique Terri :))) definitely a centre peice! This look beautiful, like this idea. Great ideas and beautiful photos Terri! Initially i thought u meant to eat it! Then when the idea hit on me, wow! Brilliant! You are so creative and original.Good luck. WAH!!!! How i wish i'm still in kk..
tina: hi dear! how are you?? my regards to pat n shall we meet in ag end of the year? hey thanks, check in daily n make comments to het tt camera ok! lhb: you are so sweet n encouraging. thanks! ann: thank u. u know, i feel so good today. the first day, i felt so defeated! sonia: thanks. i think it'll be a good idea for christmas deco don't u think? b: oh thank u! how was sh?! Yes, the spice pyramid looks very striking! What a great pyramid and one can just chuck it in the stock for flavour. You are very creative. Good idea and it's so pretty. Thumbs up my dear. Keep it up. Have been clicking on your blog everyday. Hello dear..Im checking out who is the participant of the Royal Selangor contest and I found your link..I was excited to know and find out what will the contestant do with the mould..wallah...not only you guys are so creative!! but your recipes also look delicious!!! Keep up the good work and GOOD LUCK! the most creative recipe in this competition by far. doubles up as centrepiece AND recipe! 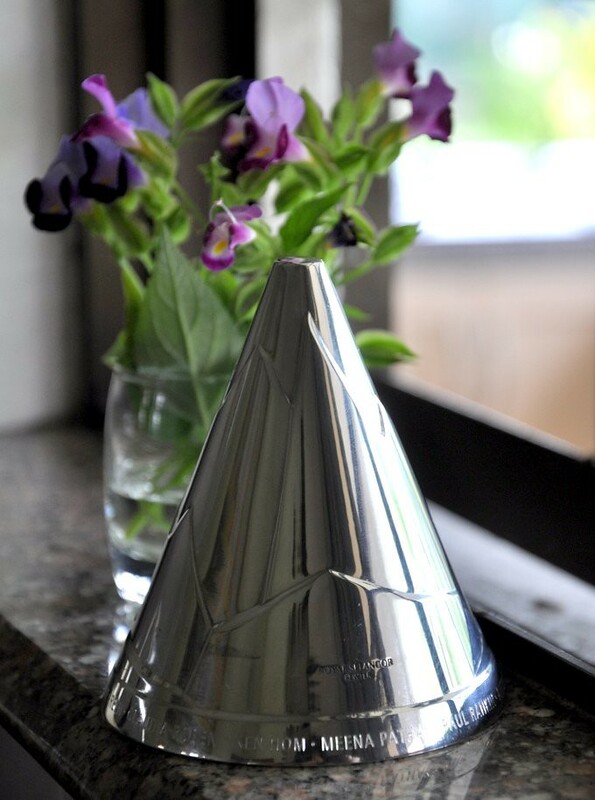 Your spice pyramid looks really lovely, it would definitely look good as a centerpiece. Wow wow, another great creation. something we can do and try at home with our family. wow, a very creative masterpiece. Wow! Terri! Out of the world. SOOO creative and pretty! You are amazing! If you don't win this, I don't know who would! this is absolutelyyyyyy beautiful!! !...you are so creative.